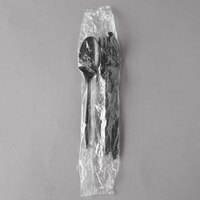 The Visions wrapped plastic cutlery pack gives your customers every piece of cutlery for their meal in one convenient package. 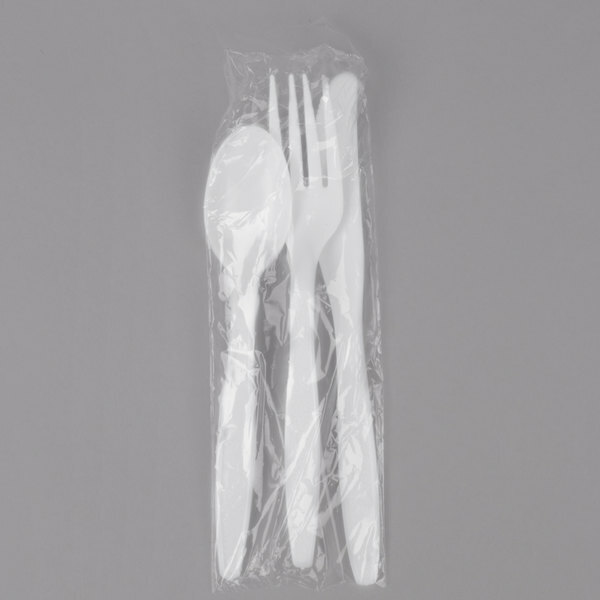 Great for catered events, concession stands, snack shacks, ball parks, or take-out venues, this Visions heavy weight white plastic cutlery pack is the perfect serving option for hungry customers! 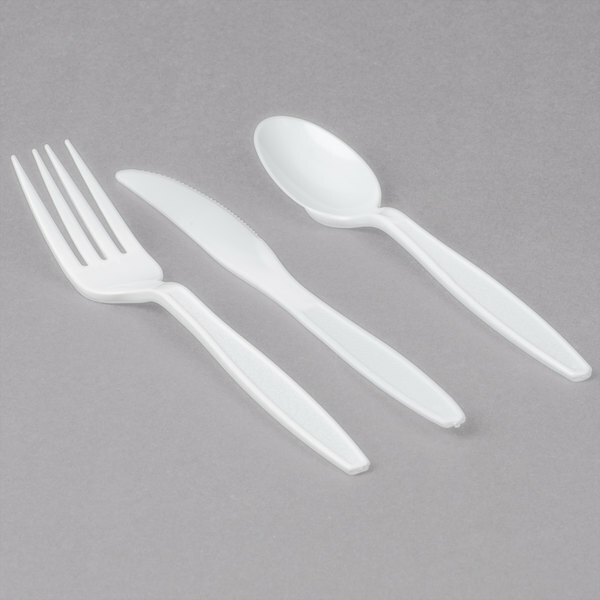 The set comes complete with a fork, a spoon, and a knife, making it perfectly suited for full, balanced meals. 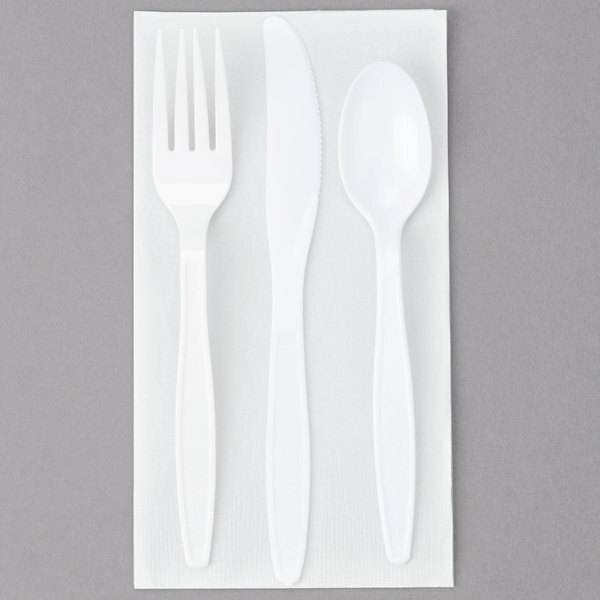 Thanks to the disposable design, you won't have to worry about collecting silverware after each use, making cleanup a breeze. "Purchased for our church's chicken and waffle dinner. The product was exactly what we needed, easy for resetting tables, the weight was perfect. We wiull be purchasing these for all future meals at the church." 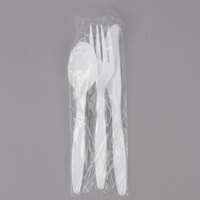 Wrapped in a clear poly wrapper, each set is protected from contamination and dirt, keeping it sanitary during storage. 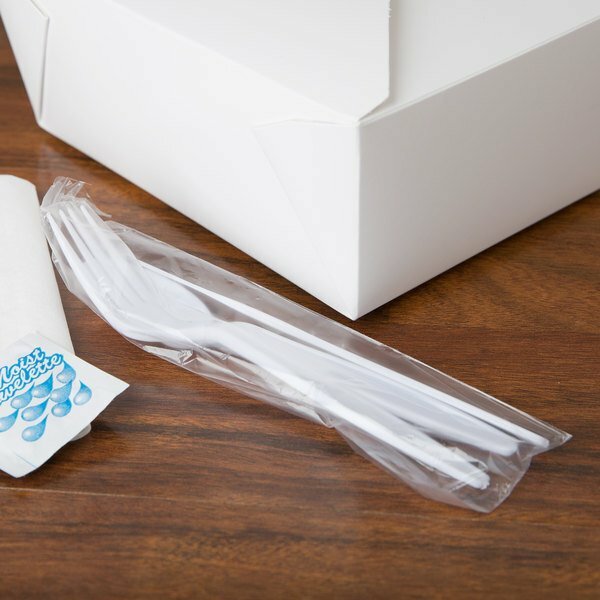 You can fill your flatware bins with these packs for guests to grab on the go at your quick-serve restaurant, or send them along with your customers in to-go boxes and take-out bags. The sleek white coloring complements nearly any dining environment and can be dressed up or down! 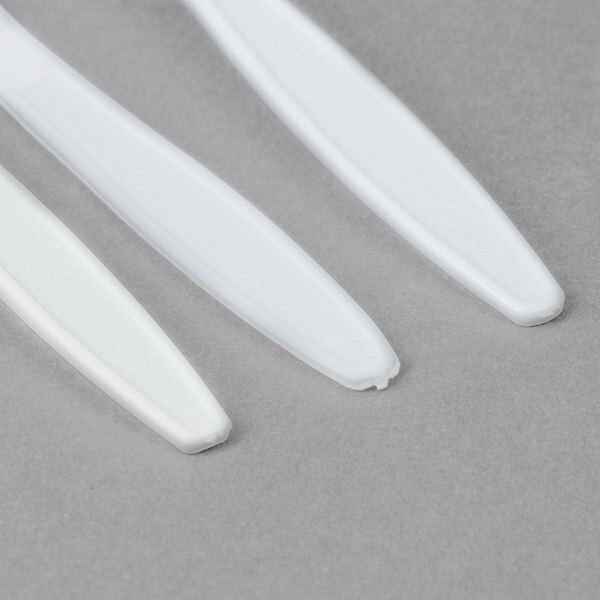 This flatware features a virtually shatterproof polystyrene construction that won't easily snap or break during use. Each handle has an intricately engraved design that adds a simple touch of style and sophistication. 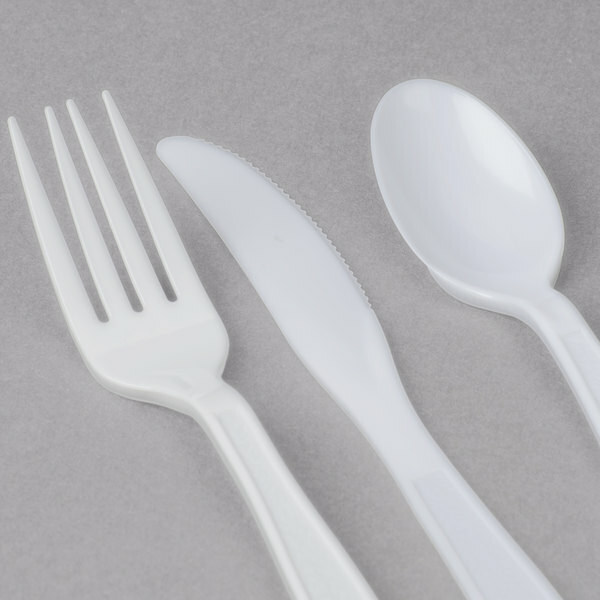 Not all plastic cutlery is created equal, and the heavier weight is certainly the highest quality option there is. 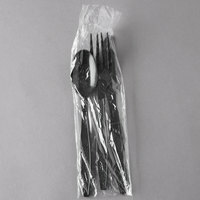 It is always a disappointment to order from a restaurant and be supplied with flatware that is not a heavy enough weight for the food being sold at that establishment. It makes for a really unpleasant eating experience for a customer when you got to cut into some meat and your fork bends on you, and your knife won't make a dent. The best option is always to err on the side of caution and buy the option that will cover anything you have to offer. This is the best bet for that! Items received in perfect condition and timing for a weekend event for a 60th birthday. 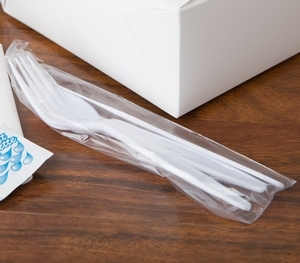 Have the utensil prepackaged saved time and money. Great buy will purchase again. This is a little bit pricy for the set of plastic ware, but the reason I bought this is the quality. Very strong and look very nice set to serve the customers. 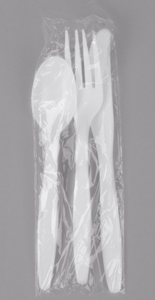 A really convenient plasticware set to have for customers. I've had these out at events and even though I had few baked goodies which required the use of them, whenever folks grabbed one, I also usually made a sale because they appreciated the availability of the. Really economical. This silver wear was great for the Thanksgiving lunch we threw. They were super sturdy and well made. I was impressed that the cost was so low for the quality we received. These came in very handy at an event where many restaurants in the area that were members of our Chamber of Commerce came together so that people could taste their menu items. The Bank donated the utensils for the event. It was great to have them all wrapped together instead of individually. 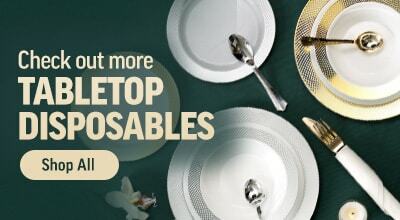 Always great items from Webstaurant! I'm a utensil snob and these packaged units make me happy. I use them for my catered lunch boxes. I have my own favorite napkins so was glad to purchase sets without the cheap napkins that usually come with. The knives are strong enough to cut through a chicken breast. Very happy. 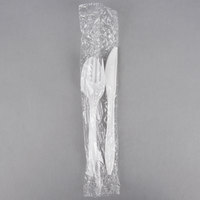 These are decent quality plastic ware. They do not come with salt pepper or napkin. But we always put napkins in to go bags anyway because of the wimpy napkins that usually come in these packs. We will probably buy again because of price. The silverware is great. I have gotten it several times and it has been fine. I received my most recent order today and it was in bad shape. The 2 cases were taped together and one was broken open with silverware spilling out. Both boxes were damaged but only one was open. It is also rainy here today and the boxes were wet. I was disappointed with the condition they arrived in. Thank you for the review! We are so glad to hear that you are satisfied with your purchase! A Customer Solutions Representative will contact you soon concerning the damages. Purchased for our church's chicken and waffle dinner. The product was exactly what we needed, easy for resetting tables, the weight was perfect. We wiull be purchasing these for all future meals at the church.